CONTINENTS fuse, galaxies collide, man dies out and the Earth plunges into the Sun. This is what will happen in the future (but don’t worry, you’ve got a few quintillion years yet). 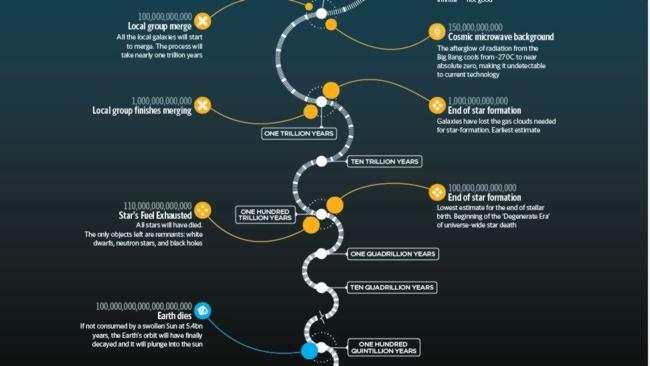 We find it hard enough to plan ahead to the weekend, but some scientists have mapped out what will happen to the Earth and the universe’s major events all the way to over one hundred quintillion years from now. 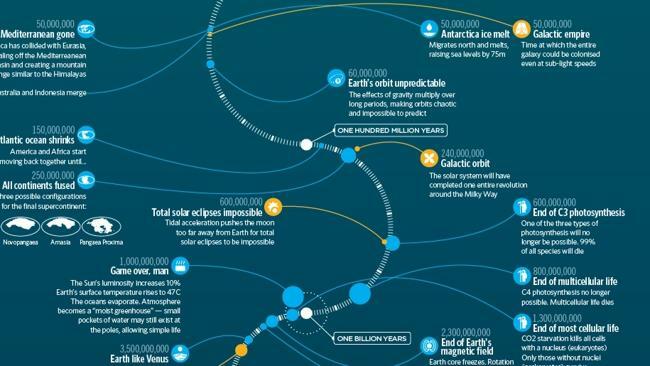 BBC Future created a meandering infographic based on research and hypothesis from scientists and NASA with major natural milestones laid out in front of our worrying eyes. The ambitious predictions begin around one thousand years from now, when most of our words would have become extinct, up to the moment when the Earth stops spinning and falls into the Sun. 5,125: Mayan time ends again. World didn’t come to an end last time. Probably won’t next time. 100,000: Global disaster. A supervolcano or climate-altering asteroid would have affected the Earth by now. 1,000,000: All glass created will have degraded. 10,000,000: New ocean formed. Red sea flooded dividing Africa. 50,000,000: Australia and Indonesia merge. 250,000,000: All continents fuse to make one supercontinent. 1,000,000,000: Game over. The sun’s luminosity rises by 10% evaporating the Earth’s oceans. 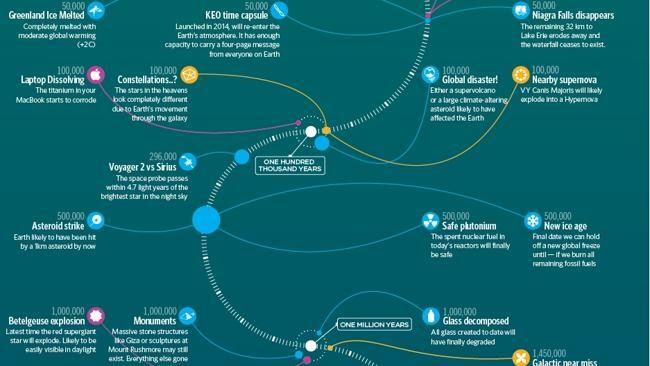 2,800,000,000: The end of all life on Earth. Even cockroaches. 5,400,000,000: Sun’s hydrogen exhausted and begins to swell into a red giant consuming nearby planets. 20,000,000,000: All matter is torn apart by the expansion of the universe. All distances become infinite. 110,000,000,000,000: All stars have died. 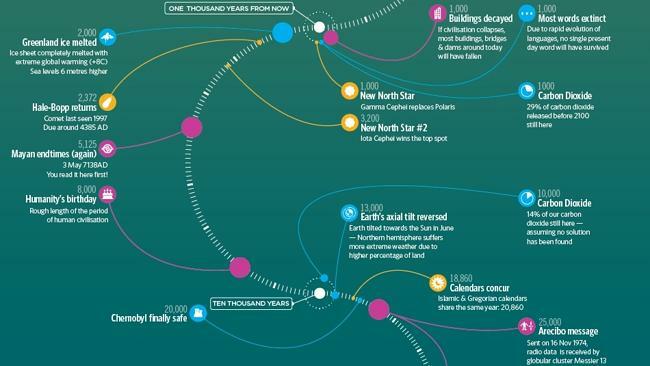 100,000,000,000,000,000,000 (that’s one hundred quintillion years from now): Earth dies. If not already consumed by a swollen sun, the Earth’s orbit will have decayed and it will plunge into the sun.